Disturbing images have emerged showing disabled England supporters in wheelchairs struggling to escape as Russian fans invaded stands. 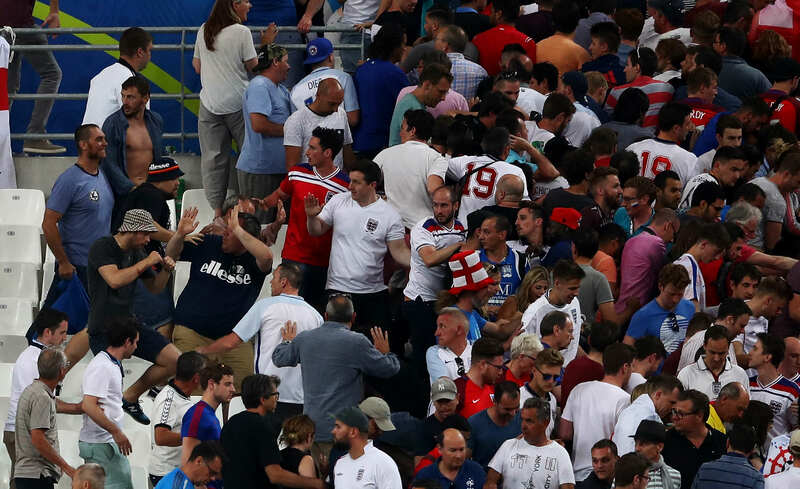 Russian hooligans in balaclavas and masks were seen attacking England fans in the Stade Velodrome in Marseille at the final whistle, reports The Mirror. As thousands of England fans ran to escape the violence a number of disabled supporters were left trapped and they can be seen struggling in their wheelchairs as the Russian thugs advance towards them. Other eyewitnesses – including BBC correspondent Nick Eardley – reported that women and children were trampled by Russian supporters during the shocking scenes. Witnesses reported there were no police in the stands and fans complained before the match there was not enough segregation in the stadium. Dozens of fans have now called for Russia to be stripped of the 2018 World Cup and the Russian FA have now been charged with three offences by UEFA – England with none. However, both countries have been warned that any more fan trouble could lead to them being disqualified from the competition amid further concerns about crowd control. 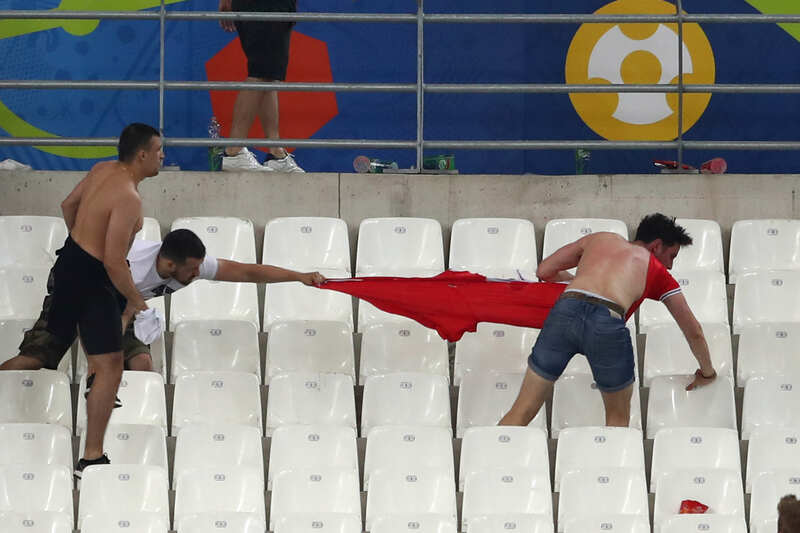 These events came after several England fans were left in critical condition – with one man fighting for his life – following clashes with Russian hooligans and heavily armed riot police before the match. 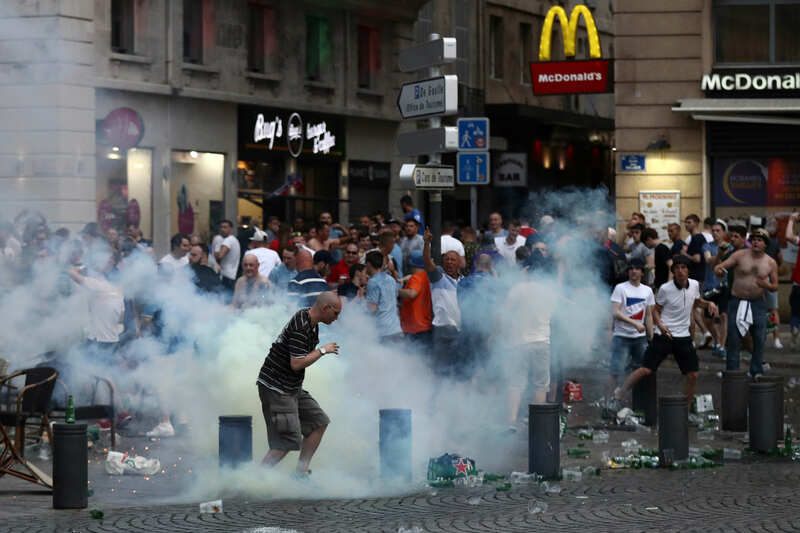 Carnage erupted as a group of up to 30 masked Russians charged England fans drinking outside bars as the French National Guard waited on standby behind shields. Officers fired tear gas canisters into the riot in an attempt to disperse the gangs before a running battle continued. Fighting also broke out in Nice on Saturday night with video showing both Northern Irish and Polish fans being attacked ahead of today’s 5pm game by the local ‘Nice Ultras’ according to witnesses. Glasses were hurled during street fights while riot police tried to regain control of the situation. The violence erupted after both sets of fans had earlier been applauded for sharing selfies together ahead of the fixture, reports The Mirror. Let’s just hope that this is the end of it.